I think Sunday is going to be the regular home for Pretty Sketchy. At least until I change my mind, anyway. 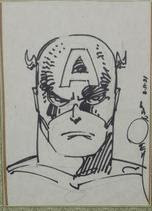 So here's the next sketch, a Captain America headshot by Walter Simonson, which is the first artist sketch I ever got, way back in 1991 at Nostalgia-Con 2 (a con sponsored by my then-Local Comic Shop, the late, great Nostalgia Ink) in Bangor, ME. Gotta love that dinosaur signature!